I love bitterness. I take my coffee black, my chocolate dark, and my beer with as much hops as chemically possible. Sometimes I bring extra hoppy beers to parties just so no one else will drink them. Kidding! But really, it’s a good strategy - beer misers take note! But what are hops, exactly? I’m going to take a moment to indulge my not-so-inner nerd, and impress you with some brewing chemistry. Humulus lupulus, or “hops” (see left) has been a crucial ingredient in beer since the year 1000, but became popular in England in the 16th century. Hops is a plant that grows added to the mixture of malt, water and hops in the first step of brewing called the “wort”. 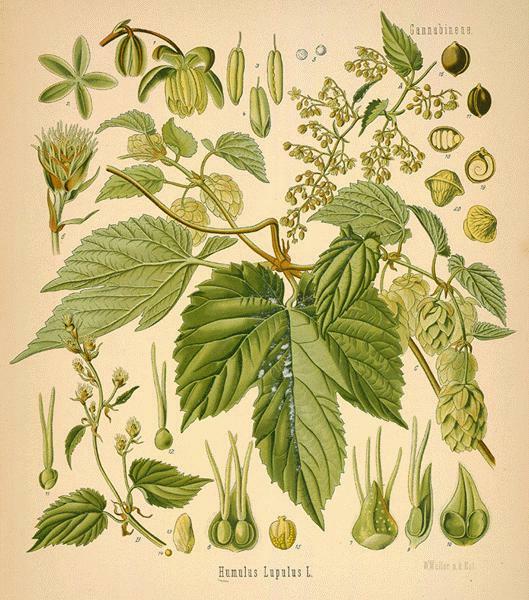 The addition of hops to beer gives rise to bitter compounds called “alpha acids” (AAs) that provide a distinct flavour, and prevent spoilage. Humulone (or lupulone) is the most abundant alpha acid, though it is converted to a more soluble form, isohumulone, in the brewing process. Hop varieties with higher concentrations of AAs are used in the boiling of the wort for their antibacterial properties, thereby prolonging the shelf life of the beer. India Pale Ale (IPA) is a very popular style of beer, said to have contained more hops in order to prevent spoilage during shipping by the East India Trading Company. American pale ales tend to be stronger and hoppier than their British counterparts. Bitterness can be measured in International Bitterness Units (IBUs), which are a function of the AA concentration. Brewed with even more hops than an IPA and typically with a ABV above 7%, the Double IPA (DIPA) is not for the faint of heart. Alley Kat has begun a series of DIPA each brewed with a different variety of hops. The Red Dragon DIPA was brewed only with Simcoe hops, . This beer was fruity and slightly sweet with hints of orange zest and caramel to balance the high IBUs. The Blue Dragon DIPA used Columbus hops, an aromatic variety commonly used in many American pale ales. I’ve photographed this beer next to a small selection of glasses from my precious collection (I have a LOT more than shown). I found this beer to be highly floral and pungent with a peppery bite. A third variety, Green Dragon, will be released in February. The brewery intends to release a new DIPA every 2 months. The high bitterness of an IPA makes this style of beer the perfect accompaniment to spicy foods. Thai seafood curry, creole gumbo, or tandoori chicken are difficult to pair with wine, but are excellent with a hoppy IPA. IPAs also pair extremely well with sharp cheeses, such as an extra old cheddar. Damodaran, S. (2008). Fennema’s Food Chemistry, Fourth Edition. Mosher, R. (2009). Tasting Beer: An Insider’s Guide to the World’s Greatest Drink. IPA in my opinion is the best kind of session beer. All this talk of IPAs, what's your favourite? Tree Brewing Company never lets me down. Their regular Hop Head is pretty good, but the Double IPA is worth the wait (should be more available this January). Five kinds of hops + 8.3%ABV + 90 IBU = Awesome.